Transitory shelters and venues for exhibitions, performances, festivals and other entertainment purposes are often an afterthought, little more than white fabric stretched across a metal frame. 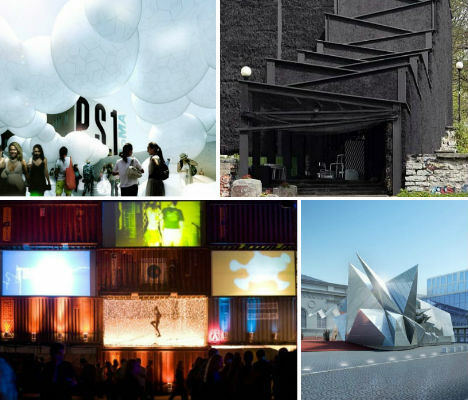 But these 13 stunning examples of temporary architecture – including a straw bale theater, a nomadic museum and an inflatable roof held aloft by BBQ smoke – are imaginative, beautiful and often sustainable to boot. 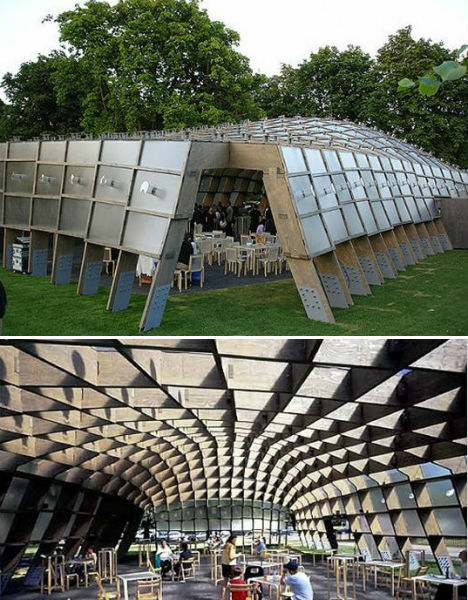 The Serpentine Gallery in London gets a new, innovative central pavilion each year, and the 2005 design was definitely a standout. Illuminated by polycarbonate panels, the solar-powered timber and metal structure created a temporary event space with a highly geometric shell-like form. 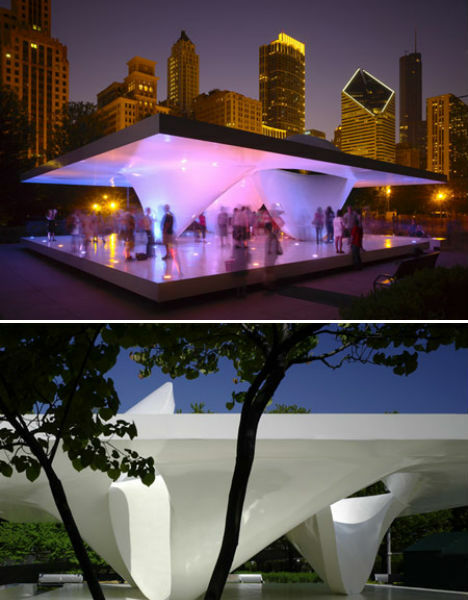 The first of two temporary pavilions for Chicago’s Millennium Park, UNStudio’s Burnham Pavilion resembles a sleek polycarbonate dance platform, illuminated in brightly colored lights after dark. 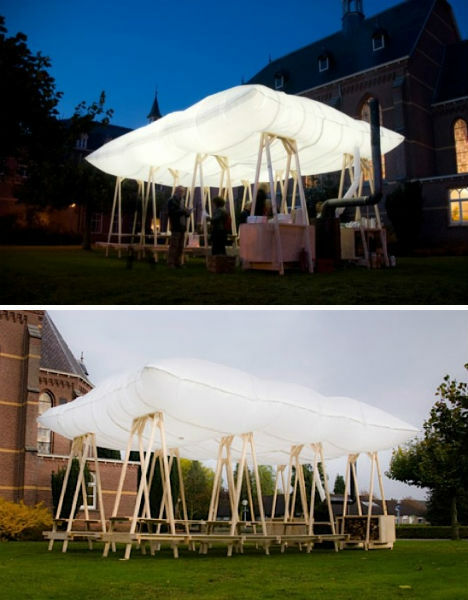 The pavilion is supported by two swooping central structures, giving the illusion of a floating platform. 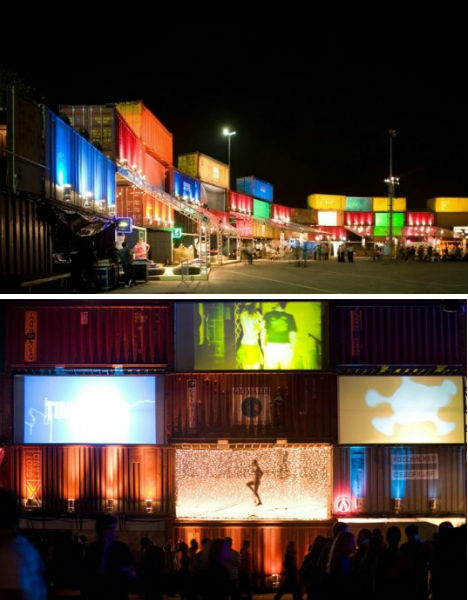 Beautiful and colorful, the temporary music festival venue designed by Barnarndes Jacobsen for 2011’s Tim Festival in Rio de Janeiro was made super-sustainable with the use of stacked shipping containers. The architect wanted a space that is low-impact environmentally but high-impact visually, and achieved this by staggering the containers slightly and filling many of the gaps with projection screens. 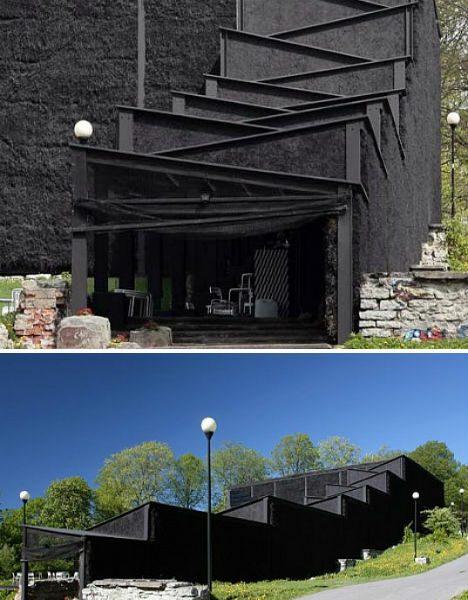 Painted in ultra-dramatic black, the NO99 theater in Talinn, Estonia is barely recognizable for what it is: stacked straw bales. Salto Architects created a temporary venue that could stand for six months and then be easily and sustainably disassembled. The straw bales were reinforced with steel trusses and left unfinished. 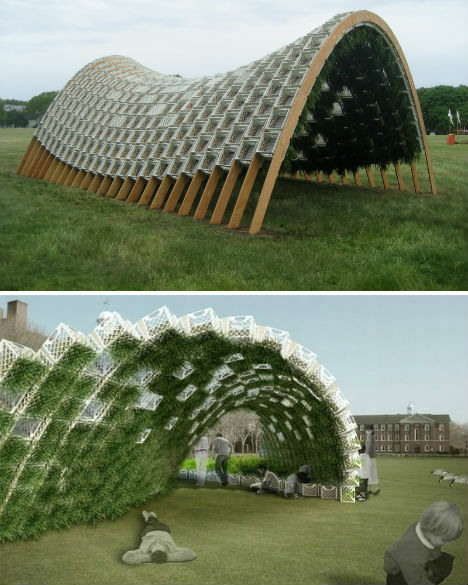 Selected as the winning entry in a first-ever annual pavilion competition for New York’s Governors Island, ‘Living Pavilion’ by Ann Ha and Behrang Behin bloomed in the spring of 2010. The low-tech, zero-impact structure uses reclaimed milk crates to create a modular planted ‘green wall’ surface. The pavilion was erected as a refuge from the heat, and included gardens planted in crates that ran along the grass beside the structure. 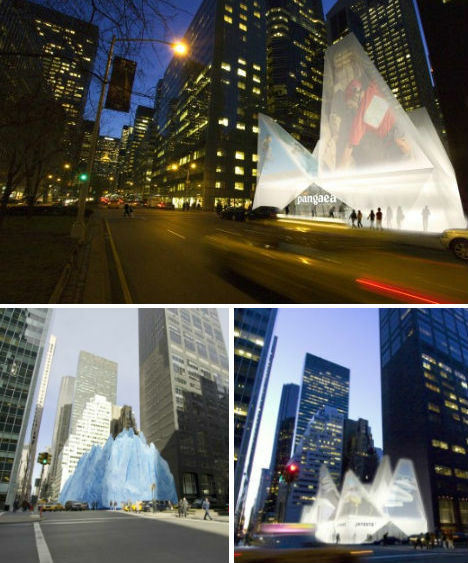 Temporary ‘icebergs’ that can act as venues for performances as well as retail space could fill in the eyesores left behind at stalled construction sites. Woods Bagot New York imagines translucent structures made of high-tech plastic fabric stretched over modular steel frames, with inflatable faceted roofs that give them the ‘iceberg’ appearance. Used to house the Ashes and Snow photography and film exhibition by Gregory Colbert in 2005, the Zocalo Nomadic Museum by Shigeru Ban and Buro Happold traveled to Santa Monica, Tokyo and Mexico City. 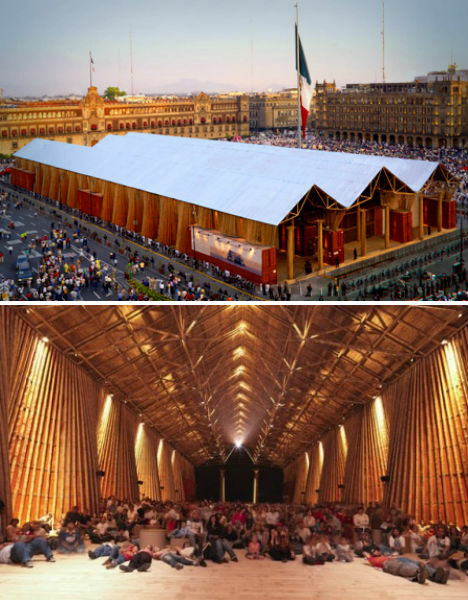 The design, originally made of shipping containers, evolved as it traveled; the most recent incarnation in Zocalo, Mexico City, was made mostly of bamboo. 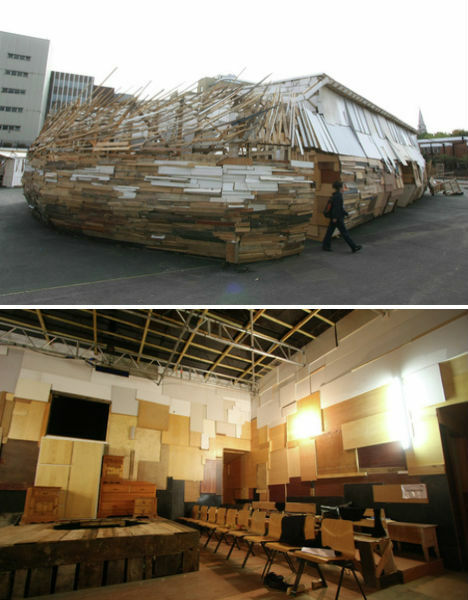 Britain’s first recycled theater was made entirely of donated and salvaged materials including pallets and discarded doors. Designed by German architect and conceptual artist Martin Kaltwasser, the Jellyfish Theater was a 120-seat venue for two eco-themed plays, Oikos and Protozoa, before it was ripped down and recycled. 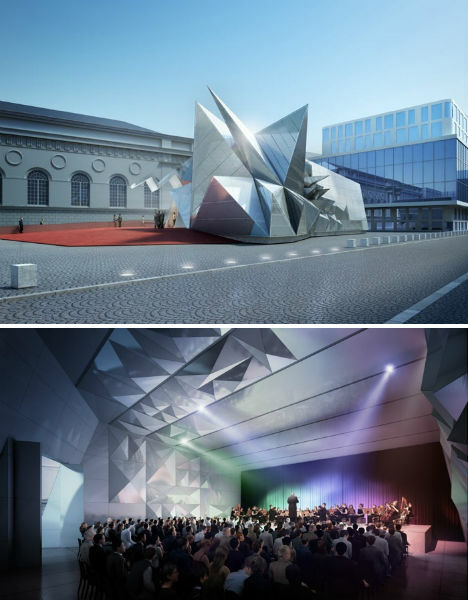 Danish design firm BIG – Bjarke Ingels Group – named this highly unusual design ‘P.S.1 out of 7295’. 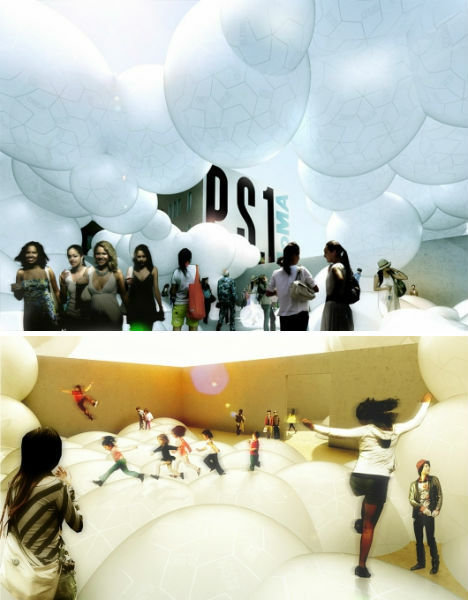 Made for a competition to design a temporary urban landscape that incorporates elements of shade, water, seating and bar areas for the courtyard of the P.S.1 Contemporary Art Center, the concept is made up of massive translucent balloons made of recycled PVC. This material not only provides the necessary shade and seating, it’s also used for a ‘mega air mattress’ for play, and a paddling pool surrounded by bouncy seating. Another design for P.S.1 is ‘Afterparty’, a system of thatched huts dreamed up by MOS Architects. 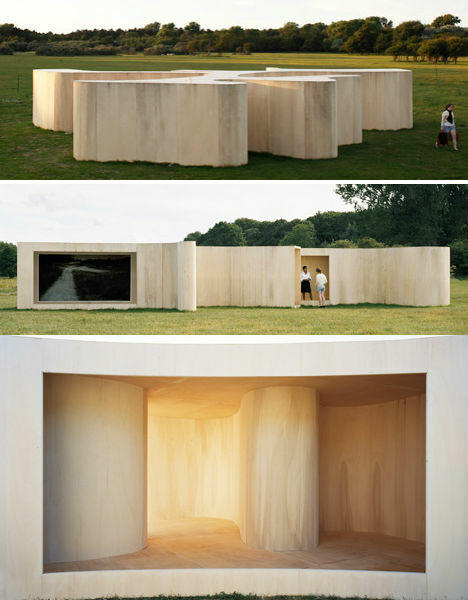 The design is sober and simple, commenting upon the current need for architecture to scale back after years of excess, but still provides all of the elements required in a temporary event pavilion. Made of a recycled aluminum frame with natural covering and a little bit of concrete, the design provides a shady, sustainable space that calls to mind the low-tech but elegant and effective architecture of more primitive times. Hovering above the ground like a giant pillow, this fun pavilion roof designed by Overtreders W for an art festival on All Soul’s Day is kept inflated by BBQ smoke. Smoke is routed from a wood-fired stove, which roasts chestnuts and potatoes, through a fabric duct and into the roof structure. 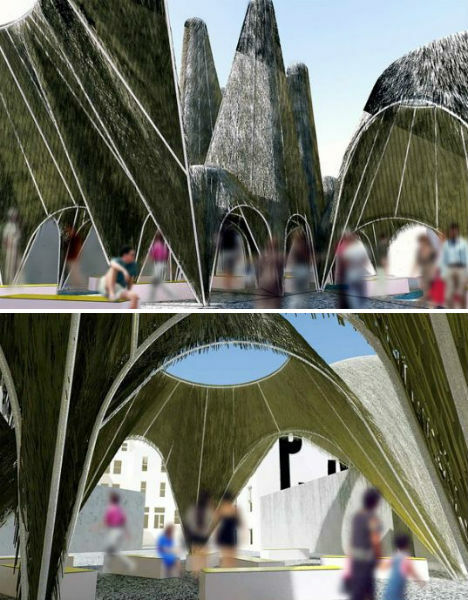 Unlike many temporary pavilions, this design can be reused, making it even more sustainable.